Summer is almost over which means back to school is around the corner! The end of the summer means something else too - summer brain drain! At the end of the summer children stop reading as much which leads to a loss of core skills (aka brain drain). 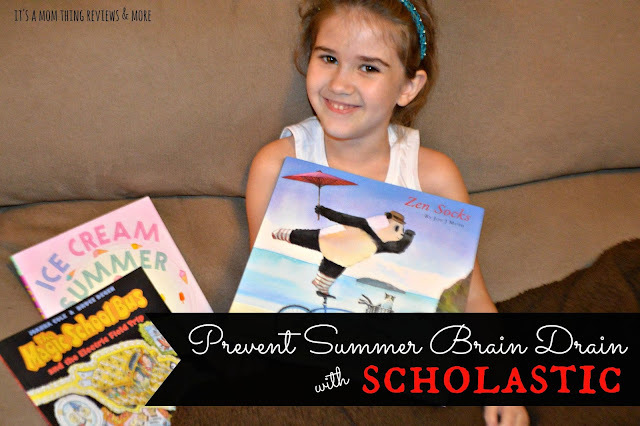 The Scholastic Summer Reading Challenge is the perfect way to prevent summer brain drain! Watch the video below to learn more about preventing this summer slide! Kids who participate in the Scholastic Summer Reading Challenge can log their reading minutes all summer, unlock stores, earn rewards, and help set a new reading world record! Parents can also sign up to learn tips to get your child to read more this summer, find book lists and activities, and enter to win weekly prizes! You can sign up for the reading challenge HERE! Enter to win a summer reading package from Scholastic to help keep your kids reading. This package includes:Summer Reading printables, Scholastic Summer Reading Challenge (water bottle for parents), Bookmarks, an assortment of books (including picture books, novels and more), Posters, Signed poster from authors of “39 Clues” including Gordon Korman, Jude Watson, etc.